THE MOST ENTHRALLING AWARDS CEREMONY OF THE YEAR!!! 7th Edition Edison Awards turned to be the exciting and an energy-pumping occasion for the film buffs. More than any of its previous edition, this year happened to a real celebration as the crowds thronged and thronged to enjoy the show. It was more decorous, more colorful, extraordinary sound and what else? The best of best audience graced the occasion and made the Sunday evening a cherishing moment of this year. Dinesh Ruben from Malaysia performed the international version of ‘Oh Penne’ from Vanakkam Chennai. It was an enchanting show that gave a stunning effect across the ambience. His performance was a standout that garnered a great response across. Perhaps, if you were closing your eyes here, you would see the visuals of this song straight in front of you and such has been the prodigious spell of Dinesh Ruben. Sai Sudha came up with a folk track to enthrall the audience and crooned the song ‘FY FY FY Kalachify’ from Pandiya Nadu that won incredible applause and whistles across the podium. The dancers on the stage emblazoned the occasion with a decorous dance performance. Taapsee gained this award for her bubbly and enthusiastic performance in ‘Arrambam’. Filmmaker Perarasu handed over the award. “Vanakkam everybody!! !,” started off Taapsee as she continued to thank a couple of personalities – filmmaker Vetrimaaran for introducing her in the industry. “I was unlucky as I didn’t get any awards for past three years and I thank Vetrimaaran for giving a show here and Vishnuvardhan sir for giving me rebirth.” As VJ Ramya, the emcee of this awards ceremony asked her, who is her favourite list of actor she dreams to pair with, she brought out everyone from Superstar Rajnikanth to Vijay and Ajith Kumar. Director Atlee came up on the dais to award this prestigious award to Dhansika for her mind-boggling performance in the film Paradesi. “While shooting the climax, it was a difficult sequence and I had to starve nearly for 4-5 days to shoot this. By the end of the shooting, director Bala appreciated me for exceeding his expectations. This is the biggest compliment, I have come across so far in the industry,” said Dhansika who continued to thank director Bala for giving her this opportunity. Out of the challenging nominations – Santhanam (TVSK), Sathyan (Raja Rani), Satish (Ethir Neecha), PoweR Star (Kanna Laddu Thinna Aasaiya) and Parotta Soori (Varuthappadha Valibar Sangam). It was a tough competition indeed and online voters gave it all to ‘Power Star’ Dr. Srinivasan for his hilarious performance in the film Kanna Laddu Thinna Aasaiya. Director P. Vasu awarded this tangible symbol of excellence to the Power Star Dr. Srinivasan. Speaking on the occasion, “I have been there to many functions, but I am privileged to be here and that is because of you all fans…” Adding more on his upcoming films, he said, “I have completed shooting for Shankar’s ‘Ai’ and a film with Vadivelu.” When asked whether he will release his ‘Aanandha Thollai’ with Superstar Rajnikanath’s Kochadaiiyaan, he reaffirmed again with a big YES. “I thank my good friend here for inviting me to this Edison Award. Usually, this is something to do with the movie world. I thank you very much for making me a part of this award,” said His Excellency Tun Mohd Khalil Bin Yakob, Governor of Malacca. 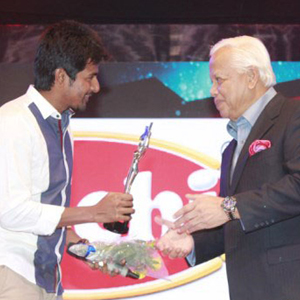 Sivakarthikeyan came up with a humorous talk… “There was an old beautiful lady sitting beside me and Vedhika introduced as her mother. She asked me what am I doing and I replied, “I just own a Tea shop here and came to deliver it here,” jocularly added Sivakarthikeyan. The actor was spellbound over the response of audience and their whistles and applause was his ticket to Oscar he believed. Dr. Rajamani made his presence to honour versatile cinematographer Ramjee for his breathtaking visuals in Selvaraghavan’s Irandam Ulagam. “First and foremost I would like thank the Tamil film buffs. It is not often the actors get appreciation for their performance in the realistic movie. Bala sir is the only person responsible for my honour,” started off Atharva who continued to add that there was no such hard phase we had experienced while shooting this film. “When we watch the film on the screens, we forget all such experience,” added Atharva. “Paradesi is a very special film to me. I don’t know how to thank Bala sir. I am someone completely opposite to the role that I had essayed in this movie. I can’t believe that I have done such a role. When an artist does a good job, all credits go to the technicians and actors in the film. Everyone contributed to look my character in this film. I want to dedicate this award to my mom and brother for their love,” said Vedhika and she continued to come up with a dialogue in ‘Paradesi’ that was deleted in this movie. 2013 has been a special year for Bindhu Madhavi for her back-to-back hit movies like ‘Kedi Billa Killadi Ranga’, ‘Desingu Raja’ and ‘Varuthappadatha Valibar Sangam’. All her movies have been bound to extreme humour. Is it a conscious decision? “There is nothing conscious and I am choosing the scripts and roles that interest me,” said Soori, who furthermore added that she personally loves to work with Soori. The actress was so much gleeful on winning the Classic Icon Award. V. Harikrishnan, Anandha Bhavan, Malaysia and actress Vedhika took the opportunity to hand over this ‘Best Background Score Award’ to GV Prakash for Raja Rani. The music director couldn’t make it presence here due to his prior commitments and Atlee received the award on his behalf.